Spain Has Been In The 'Wrong' Time Zone For 7 Decades : Parallels Spain's dictator Francisco Franco set the country's clocks an hour ahead in World War II in order to be aligned with Hitler's Germany. Memo to Spain: the war is over, the Nazis lost and it's OK to turn back the clocks now. German Chancellor Adolf Hitler, talks with Spain's Generalissimo Francisco Franco, in Hendaye, France, October 23, 1940, in Hitler's railway carriage. Later, Franco moved Spain's clocks ahead an hour to be aligned with Nazi Germany. It was 1940 and World War II was raging. Nazi Germany occupied Norway, Holland, Belgium, then France. Fascist Italy had already joined with Adolf Hitler. The Fuhrer wanted Spain's support next. 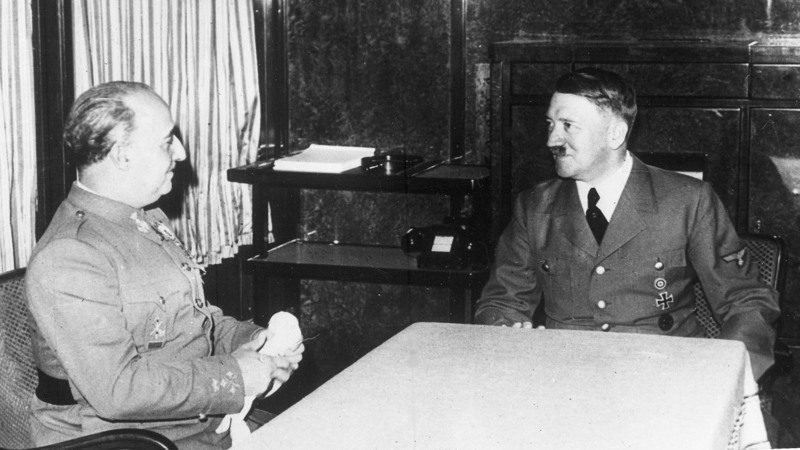 So on Oct. 23, 1940, Hitler took a train to the Spanish border to woo Spain's Fascist dictator, Francisco Franco. But Spain was in ruins from its own Civil War in the late 1930s, and Franco didn't have much to offer. He stayed neutral, but switched Spain's clocks ahead one hour, to be in line with Nazi Germany. Ever since, even though Spain is geographically in line with Britain, Portugal and Morocco — its clocks are on the same time zone as countries as far east as Poland and Hungary. Now, more than seven decades later, the Spanish government is weighing whether to change them back. 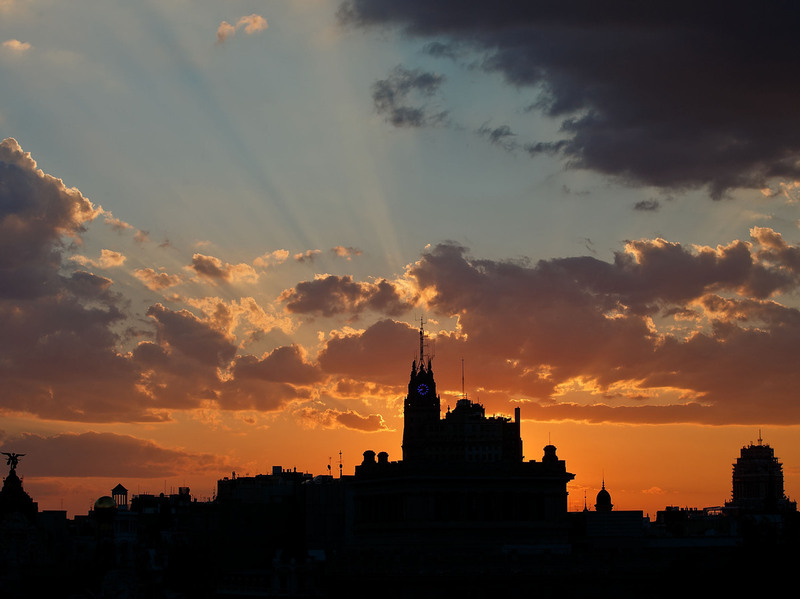 The Telefonica building at sunset on Aug. 26 in Madrid. Spain's clocks have been set to Central European time since World War II, which means the sun rises and sets later compared to countries in its region. Spaniards are notoriously late-night creatures. In Spain, the sun rises and sets much later than in the rest of the time zone it's in, called Central European Time, or CET. Spaniards sleep 53 minutes less, on average, than other Europeans. They also work longer hours — but at lower productivity. In an office park on the outskirts of Madrid, Emilio Sainz, 30, mills around waiting for his bosses to finish their afternoon siesta. "Here you work too many hours, but you need to stop at midday for two or three hours, and then finish too late," he says. "It's something cultural." Sainz is a freelance camera technician who just moved back to his native Spain from Britain, and is having trouble adjusting. He doesn't like working until 8 p.m., even with a big break at midday. How do people fill that time? "Go back home, take a big lunch — a typical Spanish meal. The siesta is optional, but if you have time you can do it," Sainz says, shaking his head. "But for me, it's sometimes more useful to keep English time. Like, to come back home earlier in the evening, to have some time on your own." In many Spanish barrios, you can't get a cup of coffee before 9 a.m. The post office is open until 9 p.m. Of course, you'll have to wait even later than that for restaurants to start serving dinner. Economists say Spain's time zone feeds that schedule — and costs the country dearly. "We have no time for personal life or family life," says economist Nuria Chinchilla, who studies work and family life at Spain's IESE Business School. "Therefore we are committing suicide here in Spain. We have just 1.3 children per woman. And it's because we have no time." Chinchilla is lobbying for Spain to go back to Greenwich Mean Time, or GMT — the time zone it was on before Franco changed it in the early 1940s. "Because otherwise, we are not sustainable!" Chinchilla exclaims. "In the crisis, we have seen that the companies that are flexible, that have more rational schedules, then they are more productive too — and they are able to be more flexible in the way they are going out of the crisis." Spain has already shortened its long holiday weekends to try to align work schedules with the rest of Europe. And this fall, a parliamentary committee approved a proposal by the Association for the Rationalization of Spanish Schedules to change back to GMT. The full legislature is expected to vote soon. But some doubt that Spanish culture — with its late-to-rise, late-to-bed habits — could be transformed by a simple change of the clocks. "For me, it's difficult to think that it'll be different — really different — from now," says Angels Valls, a human resources expert at Spain's ESADE Business School. "From a practical point of view, there are cultural roots that explain why we have this long day. It's not enough to change the hour." The siesta was a fixture in Spanish life for centuries. Before air conditioning, it was a way to get through the long, hot Spanish afternoon. Until the end of the 20th century, Spain was relatively poor, and Spaniards had to work two jobs — hence the long hours, Valls says. "So you used to work in the morning at one job. Then it was necessary to stop to rest. And then there was another job in the late afternoon and evening — in order to earn enough money to survive," she says. "It's said to be the origin of our way of life now." It's a way of life that could prove stubborn to change — especially in this economy. The 26 percent jobless rate has working Spaniards working more, frantic to hold onto their jobs. For Emilio Sainz, the Spanish cameraman who's just moved home from Britain, Spain's time zone is the late dictator's final insult. Franco died in 1975. "Franco changed a lot of things. He made a lot of mistakes," Sainz says with a shrug. "And here we are, carrying on with a lot of these outdated things."